Derby County has announced on their official website that they have appointed Frank Lampard as their new manager. Frank Lampard have been working for BT Sport as a pundit since hanging up his boot as a football player. Though Lampard doesn't have any experience as a coach but Derby believe his experience as a player can lead the team to glory. 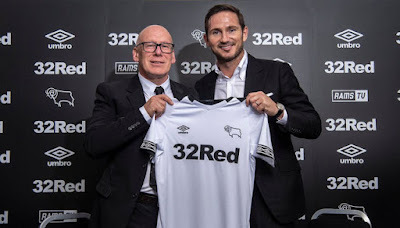 Frank Lampard will be assited by Chelsea youth coach Jody Morris and they will both strive to get Derby County back to the Premier League after being absent for almost 10 years. After signing the contract, Lampard reveal his excitement and also reveal he has always wanted to manage a club with big tradition and history like Derby County. We wish Frank Lampard all the best in Derby County and we hope he gets them back to the Premier League very soon. Are you happy with Frank Lampard appointment?